Take a tour of Goldington Power Station with former Assistant Charge Engineer, Frank Farmer. 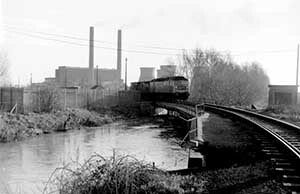 Goldington Power Station during its hey-day. The site is now built on with new houses. Photograph courtesy of Meryn Askew. Looking at the houses and avenues of Riverfield Drive between Bishops Road and Finchdale Priory, it’s hard to believe a vast power station once dominated the land, smoke billowing from two tall, elegant chimneys, four squat cooling towers standing alongside. 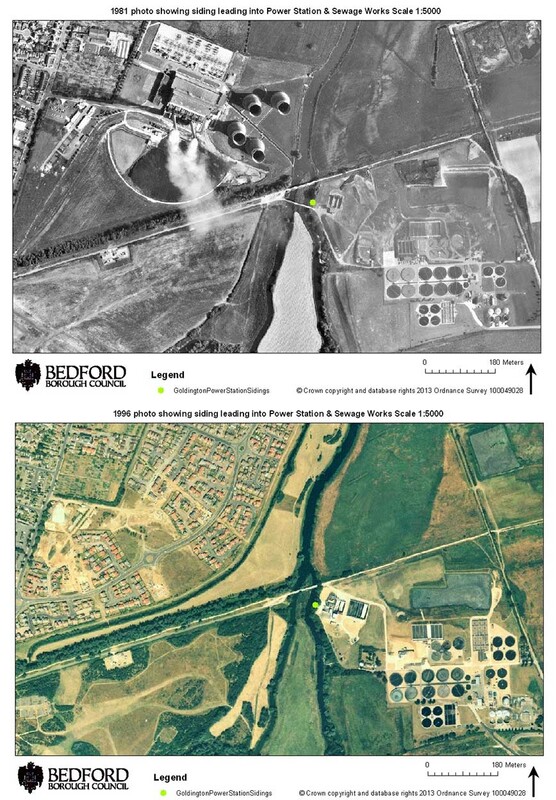 The location of Goldington Power Station in 1981 and in 1996. The Barker’s Lane allotments are in the top left corner of both aerial photos. This was Goldington Power Station, which generated electricity for the national grid between 1954 and 1983. Here was a good place for a power station. The gravel soil supported its great weight without subsiding. The railway brought coal to feed the hungry beast, which used up to 250 tons of coal an hour. The River Ouse supplied up to 6 million gallons of water an hour to cool the station. 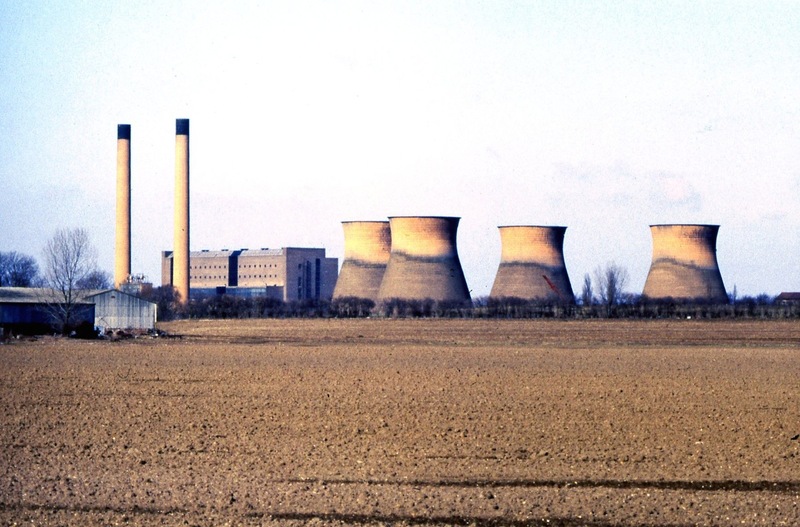 The 1950s and 60s saw many coal-fired electricity power stations built across Britain to fuel the post-War economy. Goldington began produced up to 180 megawatts of power, which was enough to power 9,000 homes. It ran at 25% efficiency, which was better than Bedford Power Station’s 17% in the 1950s but poor by the standards of 1983. 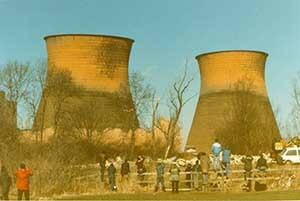 Demolition experts tumbled Goldington’s cooling towers in 1986. Photograph courtesy of Andy Croft. Frank Farmer explains how Goldington worked and what it was like to work there. Frank served in the Second World War. After his demob in 1948, Frank trained as an electrician, and joined Bedford Power Station as an electrical fitter. He worked his way up through the ranks to become Goldington’s Assistant Charge Engineer, assisting in overall charge of the station during each of the shifts he worked. Goldington had six 30 megawatt British Thomas Houston generators parallel to one another, two to a unit. There was a Unit Operator in charge of each unit, and a Foreman in charge of all three, and of switching on the pumps to supply river water to cool the condensers. The condensers cooled steam from the turbine (which turned at up to 3,000 rpm) to be returned to the boilers. The boilers operated at 600 psi and 850 °F (455 °C). The furnaces were fed with pulverised coal mixed with hot air to form a gas. This gas was ignited by oil burners in the 4 corners of the furnace which created a vortex. There were superheater tubes high up in the furnace to superheat the steam driven off the top of the boilers. Coal plant operators ensured that there was always coal in the bunkers feeding into the grinding mills. Conveyor attendants kept the coal moving along. The bucket elevator lifted coal up to the bunker belts. This had an anti-rollback device to stop the buckets dropping down, as one side would be full of coal and the other side empty. These anti-rollbacks sometimes got clogged with coal and stopped working, so a close eye had to kept on them. Life in a power station can be hectic with warning alarms going off, sudden steam blows when joints burst, noise and commotion, occasional fires, safety valves blowing, pumps running. But in general everything is taken in one’s stride, testing, maintenance, outages, permits to work all go on in a normal working day. The working conditions at Goldington were much improved on Bedford’s. Changing rooms with showers, lockers heated to dry wet clothes, and when the Health & Safety Acts came about more protective clothing, ear-muffs, gum boots, helmets and all these things were supplied. Life in general was much better for those working outside. While the coal plant was very cold in the winter, inside in the turbine hall it could get too hot. You can see the location of Goldington Power Station from National Cycle Network Route51 as it passes the New Cut north-east of Priory Country Park.